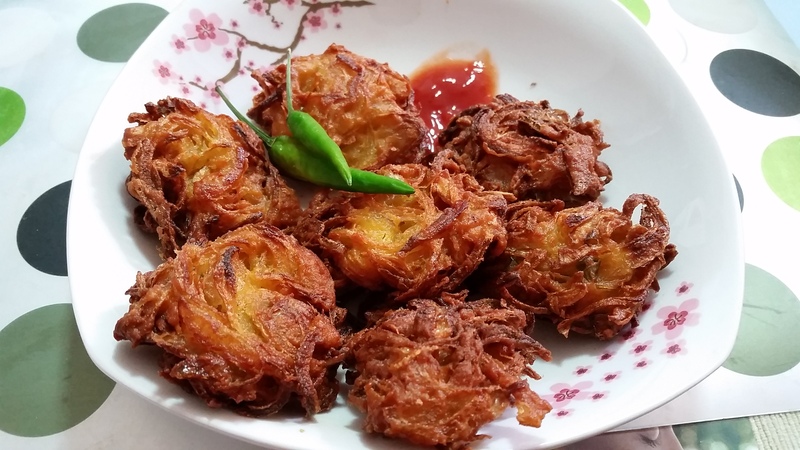 Crispy snacks made with besan(Gram flour) and onion. Take besan in a bowl. Add salt, chopped grren chili, turmeric and chili powder. Add 1 tbsp rice flour. Add 2 tbsp oil and mix all the ingredients together. Sprinkle some water while mixing. You can use your hand to mix it properly. Don’t use much water as we have to keep the mixture dry. Now heat oil. Make round and flat pieces from this onion mixture and deep fry it from both the sides. Once one side turns golden, flip and cook another side. Once cooked from both the sides, take it out and serve hot with chutney or sauce.